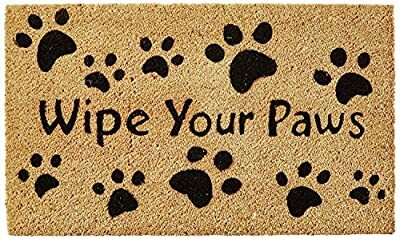 Wipe Your Paws' lettering, surrounded by paw prints. Natural Coco mat with vinyl backing. Good dirt scraper for your front door. Our are made only with the best coconut fibers imported from India. Ink for the design is imprinted deep within the coco fibers of the mat to ensure a long lasting and sharp design. Our doormats are a great, environment friendly way to make the most of your entrance.